Very Light, No Sugar is celebrating its third blogoversary! Thanks to those from all over the world (99 countries!) who have read my website over the past 3 years. How humbling to see that our words are able to reach so far, and that we remain unified in our mission to kick diabetes to the curb. This year provided different avenues of healthcare advocacy for VLNS. The Coffee Dates interview series was a big hit, and our strong resolve to make insulin accessible and affordable was a highlight topic. I am grateful to have traveled to Indy to participate in Lilly’s insulin access workshop at their corporate headquarters in April. (Yes, I still intend to blog on this; yes, I’ve drafted the blog many times, in my head and on paper; yes, I have disclosures: Lilly covered my travel, lodging, and meals.) More to follow, but briefly: It meant a lot to me to see the makers of and the history behind insulin firsthand, and to be able to advocate at that level for a better diabetes world. Also new this year, VLNS has dabbled in No Rules (free verse) Poetry. Poetry is fluid; it is not always autobiographical; it allows us to explore beyond the usual confines of writing. I am super excited for my tickets to see Neil Hilborn during his upcoming, mostly-sold-out U.S. tour! Mental health and poetry- these are a few of my fav-o-rite things right now, and no one does them better than Neil. On that note, I believe strongly that sometimes our best advocacy is to simply be honest- even brutally so. Do I have regrets about blogging? Frankly, yes. If I could go back in time, I wouldn’t have been so corny when first starting out in the DOC. (“We are diabetes warriors, waging a cliche battle, we will overcome, ahhh!”). A hard lesson in reality this year is that sometimes, no matter how tough your armor, diabetes and other stuff still hurt like hell and feel like losing more than winning. Occasionally, I wish I could crawl back under my little rock and regain my privacy and my life pre-blog. Or that there was a non-live-tweeting-your-emotional-rollercoaster space where one could simply shout at the wall. There are a lot of asks in advocacy, and it is hard to say no. But advocacy needs a better balance- taking our time (and having our time respected) when experiencing too much at once. No matter what, I will always be appreciative of this website and its following. And I hope year #4 is productive and meaningful for all of us. Very Light, No Sugar has reached its second blogoversary. Although I find myself wondering how time has flown by so quickly, that simply means it’s been a fun two years. In 2015, I had a lot to say at this time. This year, I will keep it short and sweet. Thank you to those who have visited my website over the past two years. When starting a blog in 2014 from a tiny apartment in Rhode Island, I never imagined that people in 73 different countries would visit my little corner of the internet so far this year. Although 2016 has brought some diabetes frustrations along the way, I am comforted in knowing that we have honestly shared our stories with the world. Someone out there who needs to hear our words is listening. The #doc and other healthcare arenas are platforms by which we can give a voice to a greater purpose, where we can make the decision to be good despite the bad that life throws at us. Your faith and support on the bad days make the diabetes cross a lighter weight to carry. Your genuine kindheartedness makes the good days that much sweeter. I still daydream about the day when I will celebrate blogoversary # XYZ and get to write that our communal efforts cured diabetes that past year. In the meantime, I am simply happy to have found your support, and hopefully to have offered some back in return. One year ago, on September 6, 2014, I was a shadow of the person who I am today. I was gaunt, hungry, and insulin-deprived, the result of months of insulin pump product defects and subsequent health problems due to medication delivery malfunctions. Alone and desperate for answers, I decided to start a diabetes blog from my tiny apartment in Rhode Island. Very Light, No Sugar was created, and technical insulin pump support, as well as general diabetes support, was sought. I thought that I was looking for biomedical engineering answers, but it turns out that I was really looking for something more powerful: empathy and understanding. The diabetic online community (#doc) rose to the occasion. I distinctly remember, years earlier, sitting at my desk overlooking a soccer field during my junior year of college. I Googled “diabetes blog,” and clicked on sixuntilme.com. Wow, can she write!, I thought, as I nodded my head along with the words that I read and laughed at Kerri’s signature humor. At the time, blogging seemed like something really cool for other people to do, but not for me. I was too busy pretending that diabetes-related anxieties were not affecting my life negatively. What do I really have to say, anyway? Reflecting on the past year, right now I want to speak to those who think similarly to how I did in college. Trust me here; you do have something to say and something to write. Go for it. The #doc is generally supportive and uplifting, and each member offers a unique perspective peppered with the common bond of diabetes, whether as those with T1D, T2D, LADA, MODY, cystic fibrosis-related diabetes (CFRD), or as friends/family/caregivers. We all “get it.” Your perspective is part of the larger fabric of diabetes which connects us all. Isn’t that voice worth sharing, then? When I started Very Light, No Sugar, I was the epitome of the dorky new kid on the playground. I tweeted and retweeted and never stopped virtually talking. Even today, live-tweeting my emotions could land me on TLC’s My Strange Addiction. [Insert “thumbs up” emoji]. Back in September of 2014, some criticisms labeled the #doc as too “exclusive.” I had only been in the #doc for a few days or so, but my first impressions of its friendliness meter were positive. So, I threw myself into a Twitter conversation amongst many “#doc pioneers” (i.e. the “big names with big hearts” whom we all love- no need to name-drop here) regarding how to make everyone feel welcome. Much to their credit, the #doc pioneers did not bite at a newbie who had very little perspective to offer at the time. To be honest, I did not really belong in that conversation. But they entertained my rookie thoughts, which went something like, “THE #DOC IS GREAT. EVERYONE IS COOL. BE FRIENDS WITH ME!! !” (I’m blushing as I write this). My point here is that when you start a blog, you cannot possibly be as nerdy as I was, and the #doc embraced me. Sooo, again- go for it! My largest piece of blogging advice would be to foster genuine connections, which begins with being your authentic self. If others take the time to comment on your blog or to tweet at you, write back! Understandably, there are some #doc superstars who get inundated with messages; it is unfair to expect that they can respond to every single one. But for me as a “humble beginner” blogger, I had a lot of time on my hands. So I took an extra few minutes to engage with my audience, and I now consider many of those who I interacted with to be my friends. Also, dive into weekly chats like #DSMA and #DCDE for helpful advice and comradery. While I still have room for improvement in my diabetes management, I can say that I have grown into an emotionally-stronger person through this experience. I have also learned that each person’s diabetes management choice is a very personal one; do what works for you. We have plenty of options, and nothing has to be permanent. Although we are unique individuals, we make up a larger whole- a powerful, inspirational, worldwide community. At the time of publication of this post, my blog has been viewed in 58 countries, from here in the United States to Madagascar to Afghanistan, and many more globetrotting locations. That fact, in and of itself, has made me a better person. I am no longer desperate and alone. People from all over the world understand and support the same fight against diabetes. All I can say is, “Wow!” Although I wish that this disease did not touch so many of us on an international level, it is humbling to know that we are all in this together. Thank you for hearing me out on the good days and the bad days, and thank you for allowing me to do the same with you. Thank you to those who email or message regularly with me (you know who you are); I cherish the wisdom, strength, and support found in our virtual Pen Pal notes. Thank you to those in the Boston area who came together for our inaugural #BetesOnTap meet-up, which offered social support for diabetics and filled a void in my heart that I had not quite acknowledged before. I write often about electronic forms of communication, but- with her permission obtained beforehand- I want to note that my first old-fashioned mail came from Hope Duncan in New Zealand (NZ). I admire Hope so much for the wonderful example she sets for youth with diabetes. She is also one of the most talented artists out there, and I encourage you to check out her creations on social media. 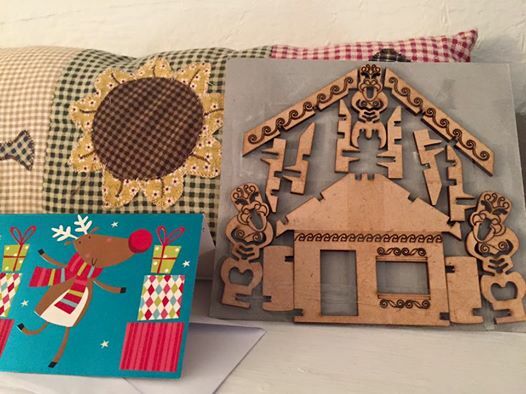 The marae model (pictured above, along with Hope’s card) represents the #doc to me: a meeting place that feels like home, where all of the puzzle pieces fit together as part of the larger story of community. One year later, I still want a cure for diabetes to help our community, our marae. I still hope and dream and pray for it every day. One year later, I am motivated to achieve better health and to try new approaches if needed. Through the #doc, I have a safety net of support to catch me if I fall or to cheer with me when I succeed. Likewise, I hope that in my own way, I have given the same support back to some of you. One year later, I look forward to fostering new friendships and learning more in the online world of healthcare interactions, particularly with Stanford Medicine X (#MedX) coming up shortly. One year later, I still drink very light, no sugar coffee, and one year later, I still lift my coffee mug to all of you. Thank you, #doc- for everything. Thank you for who you are and for what you do, for advocating long and hard, for listening, for talking, and for caring. You inspire me every day, and I feel so blessed to consider you my friends and diabetes family. Cheers to many more years together!